One enjoyable aspect of Politico’s campaign 2012 e-books is the braggadocio. There is an unmissable subtext: Politico has been owning this campaign, and the rest of the media’s been chasing it. And you, the reader who just spent a whole 3/4 of a frappucino on this e-book, are in on it. In the last e-book, The Right Fights Back, authors Mike Allen and Evan Thomas told the story of the Herman Cain sexual harassment scoop over two pages. Jonathan Martin’s confrontation with a lying Cain, caught on tape, was retold minute-by-minute. Hundreds of people, he said, had known about the sexual harassment allegations against Cain at the National Restaurant Association; how had the press been so slow to catch on? Was it because they were lazy? 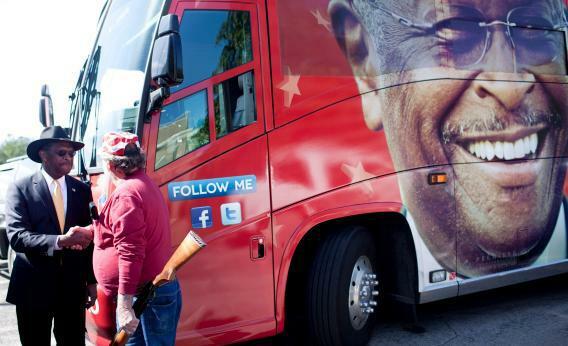 Or maybe just enjoying the Herman Cain show too much to check him out? How lame was the rest of the media, amiright? Contrast this with how the e-book covers the Daily Caller’s damaging scoop about Michele Bachmann’s migraines. Dirty tricks and underhanded attacks are part of politics… someone told the Daily Caller, a conservative website, that Bachmann was subject to incapacitating migraine headaches… the health rumors were exaggerated, her campaign manager, Keith Nahigian, told us. Then, later, we learn that Bachmann “did take medication to control her migraines.” Odd, given how the story was just a dirty trick played on a conservative website.